The movie shows a fluid in a rigid pipe which is connected to a hose of rubber-like material. A piston moves downward through the pipe thereby pushing the fluid into the hose which is sealed by a disc at the lower end. The hose bulges due to the increasing pressure until, finally, buckling into a state of lower energy occurs. The direction of the buckling is purely statistical. The model on the right is a zoom into the model on the left. 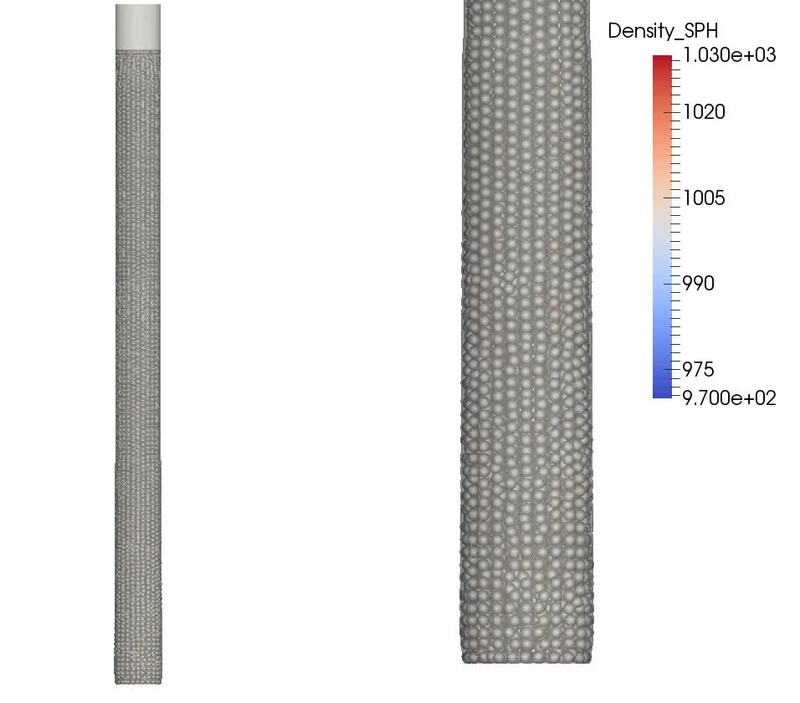 The result is obtained from a co-simulation using the smoothed particle hydrodynamics (SPH) software SimPARTIX for the fluid and the finite element method (FEM) solver Abaqus for the hyperelastic hose. The coupling between the two codes is realized using the co-simulation interface MpCCI.